After writing this morning about not being able to find the magic in India, I realized that I’ve had it inside me this whole time. I just wasn’t recognizing it, seeing it, experiencing it, feeling it or embracing it. Swami Shree has told me all week long that the divine is inside. Valerie challenges and inspires us to find that intuitive wisdom that lives within us. Today, I’m acknowledging that the magic has always been there but perhaps my magic was waiting to be awakened. I recognized it when I captured the essence of the country in my journal after my arrival to Delhi. I saw it when I watched the community of Rishikesh come together at Ganga Aarti to honor the holy Ganges river. I experienced it when we visited the Maharishi Yoga Ashram and we sang Beatles songs as we walked the grounds. I felt it when we chanted harmoniously together during our yoga session this morning. I felt a resounding vibration rising up out of my heart. I embraced it when I connected with Valerie today and I admitted that I was having a hard time feeling the magic but that I actually had it inside this whole time. I still have a lot to see on this side of the world and I want to be sure I get the most out of this experience as I can. I don’t want to be ungrateful, impatient, or resistant with the experience. I am free, open minded and full of love, wonder and enjoyment. As a life coach and yoga therapist, Valerie is a great teacher, a guide on this spiritual path and a phenomenal leader on this amazing journey around Rishikesh. Val and I have been friends since I moved to Boulder and we bond over the NY-CO connections. She mentors me on my offering to the world, whether it be in yoga, personal relationships or business. I am eternally grateful to have her as my teacher. Here is a overhead shot of this magical land. 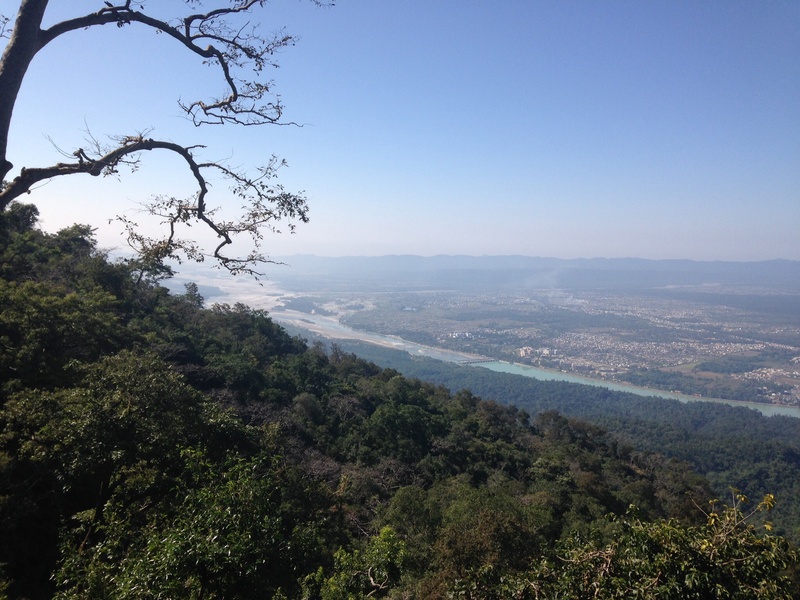 From our hike to Neelkanth Temple yesterday.